During a recent visit to the United Kingdom, US President Donald Trump gave Prime Minister Theresa May some “brutal” Brexit advice. According to Mail Online, Trump told May that he had a list of his favorite New York lawyers who he believed could handle the matter. Speaking at a joint news briefing with May, Trump said that he had given the prime minister a “brutal” option that she had not heeded. Appearing on the BBC’s Andrew Marr Show on Saturday, Theresa May was asked to elaborate on the option Trump had referred to. “He told me I should sue the EU,” the PM replied. "Sue the EU. Not go into negotiations – sue them," she added. Theresa May made light of the suggestion, however, insisting that her focus was on achieving the best Brexit deal possible. In an earlier interview with British journalist Piers Morgan, Donald Trump said that he had offered May an “option” that would give the UK an advantage over the European Union in the Brexit talks. 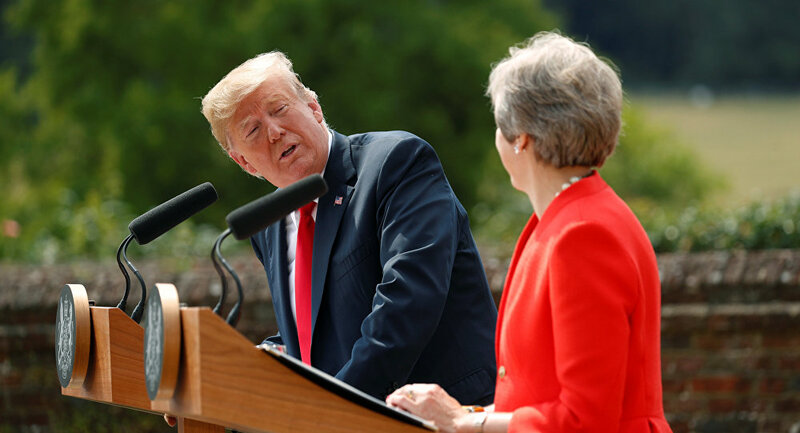 During a brief visit to Britain earlier this month, President Trump scrambled to undo the damage caused by an interview in which he questioned Prime Minister Theresa May’s Brexit plans, which he warned might hamper a bilateral trade deal with the United States. READ MORE: 'What Does Trump Have to Do' for Theresa May to Cancel His Visit to Britain?